AerSale, Inc. is a global supplier of aftermarket commercial jet aircraft, engines, OEM used serviceable material and maintenance, repair & overhaul (MRO) services to passenger and cargo airlines, government entities, leasing companies, multinational OEMs and independent MROs. Founded and incorporated in Coral Gables, Florida in 2008, AerSale employs approximately 230 people in 5 countries worldwide. Private equity firm Leonard Green & Partners and the two founders invested $250 Million in equity in January 2010. In July 2010 AerSale delivered a specially modified Boeing 737-400 aircraft to the National Nuclear Security Administration to fly depleted nuclear waste to disposal sites. It has supplied low cost used serviceable turbine fan blades to the Department of Defense for use on the Air Force's KC-135 Stratotanker aircraft, enabling the government to save over $36 Million Dollars in one contract alone. AerSale's customers include passenger and cargo airlines, government entities, leasing companies, multinational OEMs and independent MROs. AerSale operates three integrated lines of business: Aircraft & Engine Leasing; Material Sales; and Maintenance, Repair & Overhaul (MRO). AerSale sells and leases commercial passenger and freighter aircraft and engines to airline customers worldwide. It has purchased Boeing 737-300, Boeing 737-400, Boeing 737-500, Boeing 747-400, Boeing 757-200, and Boeing 767-300 passenger and freighter aircraft; Airbus A300-600R, Airbus A310-200, Airbus A320-200, and Airbus A330-300 passenger aircraft; and McDonnell Douglas MD-90 passenger and McDonnell Douglas DC-8-70 series freighter aircraft. These aircraft are powered by a variety of engines, including the CFM International CFM56, General Electric CF6-80C2, International Aero Engines V2500, Pratt & Whitney PW4000 and Rolls-Royce RB211. The company is an aftermarket seller of OEM used serviceable material. This material comes from aircraft which have been dismantled and their parts recycled and refurbished for commercial use. Recycling of aircraft for their component parts has become a significant source of used serviceable material to the airline industry, as about 12,500 aircraft will reach their end of life over the next 25 years. AerSale is a member of Aircraft Fleet Recycling Association, a not-for-profit industry group whose members maintain an environmentally friendly standard for aircraft recycling. AerSale's MRO business is performed primarily at its FAA-approved Certified Repair Station located at the Roswell International Air Center, Roswell, New Mexico. In November 2013 it completed a major maintenance check for NASA on its flying laboratory, a specially modified McDonnell Douglas DC-8-70 series aircraft. In July 2015 AerSale acquired Aero Mechanical Industries, Inc., located in Rio Rancho, New Mexico, to expand its component overhaul services to include aero structures. AerSale holds a number of regulatory and industry certifications. On March 12, 2010 the Aviation Suppliers Association certified AerSale's quality system to meet the requirements of ASA-100 and FAA Advisory Circular 00-56A. On June 14, 2011 AerSale was certified by the Aircraft Fleet Recycling Association for maintaining "best management practices for disassembly of aircraft, powerplants, and other aerospace materials". On February 24, 2014 it received a U.S. Approval Certificate from the European Aviation Safety Agency ("EASA"). AerSale's first acquisition came in 2009 when it acquired 44 McDonnell Douglas DC-8-70 series aircraft from a major international logistics company. The McDonnell Douglas DC-8-70 series aircraft is powered by the CFM56/F108 aircraft engine, variants of which power most of the world's airliners. In May 2010 AerSale acquired the assets of Great Southwest Aviation located at the Roswell International Air Center in Roswell, New Mexico. In late 2010 AerSale acquired 19 Boeing 747-400 aircraft from Japan Airlines, representing two-thirds of the JAL fleet of 747-400s. In 2012 AerSale acquired 25 of Saudi Airlines' McDonnell Douglas MD-90 aircraft. All of these aircraft have been dismantled in Roswell and recycled for their engines and component parts. In July 2015 AerSale acquired Aero Mechanical Industries, Inc. (AMI), located in Rio Rancho, New Mexico, to expand its component overhaul services to include aero structures. AMI is a global provider of maintenance, repair and overhaul (MRO) of both metallic and composite airframe components and accessories including nacelles, inlet cowls, thrust reversers, and primary/secondary flight controls. ^ "Leonard Green Backs AerSale". The Middle Market. Retrieved 26 December 2014. ^ "AerSale Holdings, Inc. Completes $250 Million Equity Raise With Leonard Green & Partners, L.P." PRNewswire. Retrieved 26 December 2014. ^ "Government Study - Federal Industry Leaders 2012" (PDF). Bloomberg. Archived from the original (PDF) on 2014-12-26. Retrieved 24 December 2014. ^ ""Aircraft Recycling Best Practice and the Role of AFRA", Aircraft Technology Engineering & Maintenance, October 2009" (PDF). Archived from the original (PDF) on 2016-03-03. Retrieved 2014-12-26. 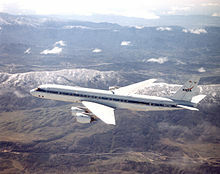 ^ "NASA's DC-8 Flying Laroratory to Undergo Major Maintenance". NASA News. Retrieved 26 December 2014. ^ "Aviation Suppliers Association Member Directory"
This page was last edited on 3 October 2018, at 16:15 (UTC).